Oops, I Craft My Pants: Ultimate High Five! Alright, I know, I've been a bad blogger. I guess I have slacked a little bit, but I've been feeling pretty crummy. I thought it was just my pain medication making me feel extra sick, but it turned out I was legitimately sick, fever and all. Well, I've done a little bit of crafting. This is another page in my sketchbook project book. 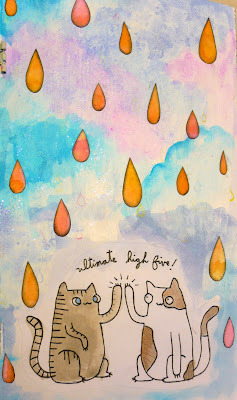 High-fivin' cats! 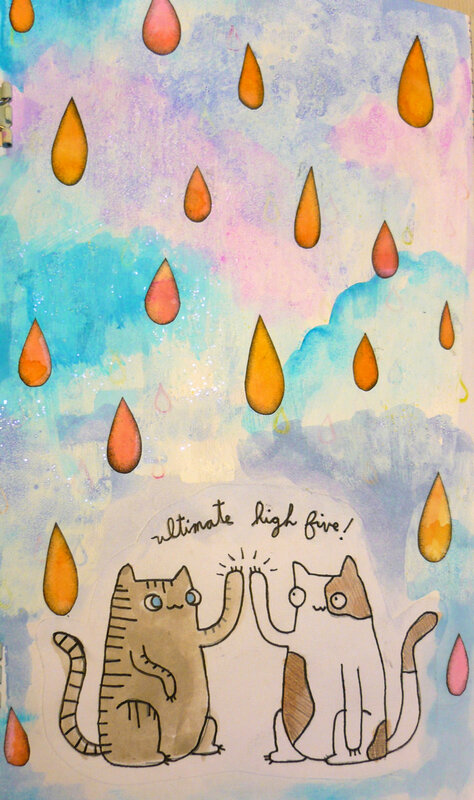 I originally drew this doodle for my BFF because she needed a picture of her boyfriend's cat and her cat high fiving so she could get it put on a birthday cake (I wish I had a picture of the cake). I had the drawing laying around, so I thought I'd use it since my theme is cat-related. The background is watercolor on a base of acrylic ink and glitter. That's why it looks a little grainy. Sketchbook Project: It's Raining Dogs and Cats!